I found a great trick in Illustrator! It makes 3D designs so much easier. Isometric designs have been everywhere the last year, and I never really bothered with them much because I felt like it took too much time. I've made a few isometric designs for my portfolio or for projects that I wanted to present more professionally, where I would take a screen from my finished design, and make it isometric and add a drop shadow. The only ways I would do that were 1) download a free isometric PSD mockup and edit the Smart Object layer with my own image 2) Use the Skew or Perspective tools in Photoshop, but I could never quite get the angles super accurate 3) Painstakingly build out every side of an illustration in Illustrator in vector with the pen tool. I've also tried the perspective grid in any of the 3 modes, but I can never get it quite how I want it. None of these options were convenient or quick. But the other day I was creating a presentation for work, and needed to make a ton of slides with isometric mockups. Instead of going my usual route in Photoshop, I did a bit of research and found a super easy way to do it in Illustrator, which is my tool of choice. This method doesn't require you to rebuild everything at an angle! Transform the height to 86.062%. Shear it to 30° with the transform tool. 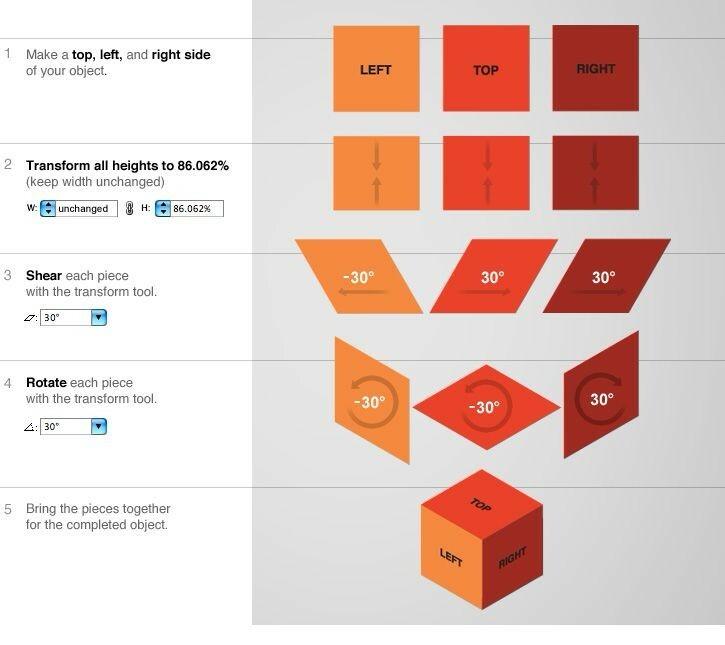 Rotate it 30° with the transform tool.